This image was taken by Nimit Nigamfrom Kaza, Spiti, Himachal Pradesh, India on Sept. 17, 2015. Resembling a thousand sparklers on fire, this stunning image pits the shining Milky Way as a backdrop to the spinning landscape below. 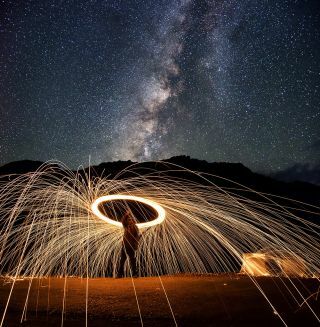 This unique method of photography is called steel wool spinning. This image was taken by Nimit Nigam from Kaza, Spiti, Himachal Pradesh, India on Sept. 17. Our host galaxy, the Milky Way, is a barred spiral galaxy seen as a band of light in the night sky. It stretches between 100, 000 and 120,000 light-years in diameter. It is estimated that the galaxy has approximately 400 billion stars. At the center of our galaxy lies a gigantic black hole billions of times the size of the sun. To see more amazing night sky photos submitted by our readers, visit our astrophotography archive. Editor's note: If you have an amazing night sky photo you'd like to share with us and our news partners for a possible story or image gallery, send images and comments in to Managing Editor Tariq Malik at spacephotos@space.com. Follow us @Spacedotcom. We're also on Facebook and Google+. Original story on Space.com.